We think it would be interesting, a bit informally, to compare prices for these different scenarios. Of course we would also like to promote our own products, but the numbers are fairly straight-forward, and should be useful to anyone charged with managing servers. In our next post we will examine performance in different clouds by making some hands-on measurements, but let’s start with a price check. Let’s start with a scenario, where you buy hardware and install the standard edition of VMwares’s flagship product: vSphere Standard. VMware have been so kind as to make available a price calculator. The main purpose of the calculator appears to be, to show how affordable VMware is compared to Microsoft, but it will work for our purpose. 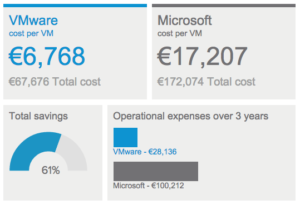 Let’s try to calculate the total cost of running 20 virtual servers for a 3 year period, according to VMware. We assume that each virtual server is configured with 2 vCPU’s, 4 GB RAM and 100 GB disk space, so we may choose VMware’s suggestion for a medium-size hardware setup. We choose NFS-based storage for affordability and portability, and 4 servers per physical CPU, which seems like a reasonable density. With the options described above, the calculator comes up with a whopping total price of $146,468 in total expenses for running 20 virtual servers for 3 years on a single physical server with 128 GB RAM. VMware is including $77,587 in expenses for software licenses. Electriticy, physical space and quite a bit of work is of course required to run this setup, so WMware is also including $7,607 in “data center expenses” (including electricity), and approximately $11,474 in sysadmin salaries. For this little comparative study we will disregard the last expense. Your sysadmin will probably cost you a lot more anyway. VMware’s example does not include backup, but we can guarantee that it includes a lot of time aquiring and configuring hardware and software, licensing Windows Server, SQL Server, etc. We think it looks a bit expensive and frankly a bit painful. Som may object, that they can do it cheaper than the example above, but in our experience the reality is that it is probably the other way round. Aquiring and configuring backup hardware, backup software, monitoring software, establishing sysadmin duty schedules, paying for service agreements, designing and building server rooms, all tends to push total costs substantially upwards compared to the above. And that is one of the points we’re making: With a true self-service cloud, private or public, you fundamentally do not have to spend your valuable time negotiating with multiple vendors who will sell you servers, storage environments, backup environments, VMware licenses, Microsoft licenses, etc., but can focus on your mission-critical applications. Now let’s check if the cloud is also more affordable. What would a similar setup cost to run in Amazon’s cloud for 3 years at their current rates? The kind Amazonians have also produced a price calculator – they call it simple, but then again, we already commented on Amazon’s aproach to simplicity. We chose the server variant Linux c4.large with 3.7 GB RAM and 2 vCPU’s. As storage we have chosen a 100 GB SSD volume with up to 400 IOPS for each virtual server. This is realistically seen a less powerful setup than the VMware setup above, but we think it’s close enough for a comparison. With AWS you of course don’t have to spend time purchasing and configuring hardware, but if you plan to to move existing servers into AWS, do schedule a lot of time, since it is a pretty complicated process. 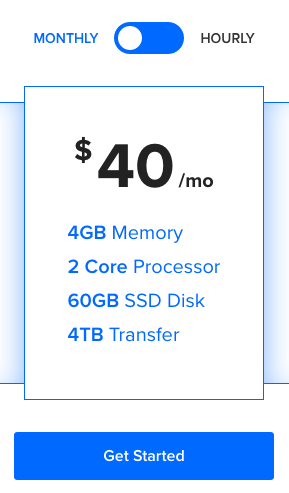 Amazon’s price calculator says 3,373 USD a month, or 121,428 USD for 3 years, and no, this figure does not include any real backup or monitoring of you servers. You can of course buy this as extra services in AWS. Expenses for a sysadmin/devop to configure and maintain your setup is of course also not included in the figure. Even if you save time not having to aquire and configure hardware, AWS is in no way a simple system to find your way around, så considerable ressources have to be allocated for this. Quite surprising to us, it looks almost as expensive to run your servers in AWS as running them on a dedicated VMware environment. 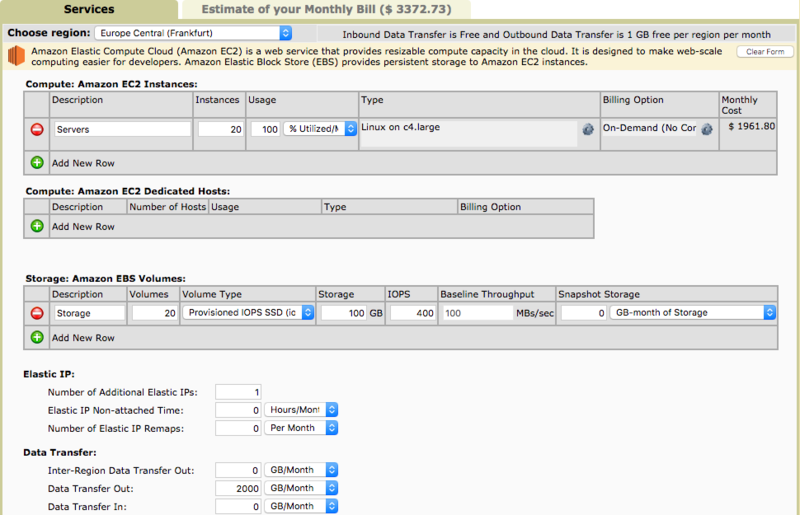 Of course AWS gets less attractive if you do the calculations for a 6 year period instead of a 3 year period. AWS expenses will remain relatively flat year after year, while operating expenses for a dedicated setup will remain low after the initial expense. A bit simplified you could argue that AWS is economically attractive for businesses who are in a situation where they can save the cost of a dedicated sysadmin, by giving devopses and developers direct access to servers running in AWS. 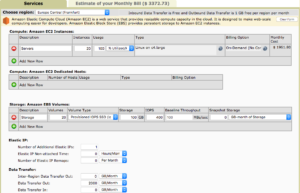 Now let’s check what it would cost to run 20 virtual servers configured with the same specs (4 GB RAM, 2 vCPU’s, 100 GB HD) as in the VMware calculation in our own public cloud – Origo Cloud at our current rates. We have also produced a price calculator. It gives a monthly price of 6,000 DKK or approximately a price of $31,076 for running the 20 servers continously for 3 years – backup and monitoring included. We’ll admit that it did come as a bit of a surprise, that our standard pricing is under a third of what Amazon is charging. To this you can even add, that we do special deals and deep discounts if you are comfortable committing to e.g. 6 months or more. But what about the new super cheap IaaS vendors like Digital Ocean you may ask. It’s hard to believe that it’s still less expensive long term, to build and run your own hardware infrastructure. Let’s have a look. At Digital Ocean simplicity is king, and you can only choose between fixed plans with fixed size servers. The closest match we can find to our other examples is their standard-server with 4 GB RAM, 2 vCPU’s og 60 GB disk. We have also chosen to add 2 TB block storage, in order to match the VMware baseline a bit more closely. In total this adds up to 1,000 USD per month, or $36,000 for 3 years. There is little doubt that Digital Ocean have established a very low industry price point. It must be said, that this is probably also necessary in order to challenge the dominance of Amazon. At this low price you have to accept that Digital Ocean does not come with any meaningful SLA. Stories of data loss with failed Digital Ocean servers are scattered all over the web. Telling your boss that Digital Ocean gave you a gift card of 40 dollars of credit with them, after losing your company’s most critical database is probably not a good idea. It is also worth noting, that you are pretty much locked to Digital Ocean’s standard server configurations, so you can not e.g. run Windows servers. It is also not possible to upload your own virtual server images or download images from Digital Ocean. In short: Digital Ocean is a good fit for a newly started business without existing servers, who want to establish a Linux-based infrastructure. It is not a good fit for business who are looking to move existing servers to the cloud. Also keep in mind, that there is no obvious path to move your servers away from Digital Ocean, should that be necessary. Finally, let’s examine what it would cost to run 20 virtual servers, configured as in the other examples, in a private cloud from Origo, i.e. on an Origo Engine C1 aquired for this purpose. Basically an Engine C1 will give you the same posibilities as a dedicated VMware setup, but everything is packed into one box ready to run, and mostly maintenance-free. You also get a great web UI for managing your virtual servers and infrastructure. You can configure exactly the server configurations you want, you can upload your existing images and you can run any server type you want, including Windows servers. In contrast to Digital Ocean, a private cloud is well suited to businesses with existing servers and an existing infrastructure they want to move and simplify. It should also be mentioned, that virtual servers are run off SSD’s with thousands of IOPS available and that you quite easily could run double the amount we are considering here. Let’s for argument’s sake assume that you only ran 20 servers for 3 years. Like in the VMware example we’ll ignore sysadmin expenses, and we’ll set “data center expenses” including electricity to $5,000. An Engine C1 costs $25,000 which then gives a total price of $30,000. This includes backup (through an included 10 TB hard drive) and built-in monitoring. If we take into consideration that you could easily run 40 virtual servers of the size considered on a single Engine C1, and expand the considered time-span to say 4 or 5 years, the price per virtual server could be pushed even more dramatically down. Running your servers in the Cloud comes with a lot of advantages, especially for businesses who to not want to be troubled with hardware and running server rooms. Cost savings however is not necessarily one of those advantages. If you are starting af business, don’t know how many servers you will need and only expect to run Linux, the a public cloud is the obvious choice. AWS is an expensive and complex solution, which in our opinion can only be justified if you have a need for some of their other services. It is worth pointing out that you to some extent risk locking yourself and your business to AWS and with that, to their high prices. In reality it is mostly their CDN CloudFront which is relevant to most businesses, and there are plenty of solid alternatives to that, including CloudFlare. If you are interested in a self-service cloud, and especially if you would like to keep your data in Europe, we think our service is a solid choice. If you have an existing collection of servers, a private cloud looks very attractive. Even more so, if we expand the number of servers to 40 and the number of years considered to 5. In this case the price for runing in e.g. Digital Ocean rises to $120,000, while the price for running these servers on an Origo Engine C1 rise to $40,000 when we include the relatively high estimate on electricity and data center expenses. In short, if you are starting a business and need to run a low number of servers, go with the public cloud – we recommend trying one of the more affordable alternatives to AWS. If you know you will be running 20 servers or more, a private cloud is a very attractive alternative. VMware only really makes sense, if you have in-house sysadmins who won’t touch anything else, but frankly – maybe it’s time to expand their horizon. If you found this analysis interesting, you may want to take a look at the follow-up analyses, in which we test performance in the various clouds hands-on. Also remember that you may subscribe to our newsletter, if you want our articles directly in you inbox.